A few months ago my friend and fellow knitblogger Gale and I began planning a Photography for Knitters Workshop to be held at my library. And yesterday was THE day. I was really excited to take a photography class from someone who “gets” the whole knitting thing and I was not disappointed. 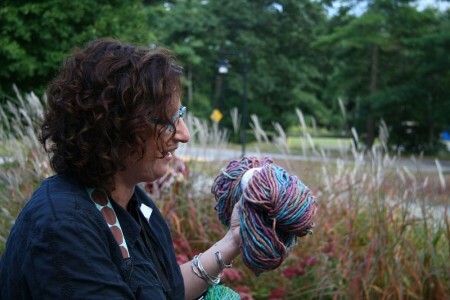 Here’s Gale with some yarn. She was sniffing it, moments before. I told you she gets it. Part of the class was a slideshow of Gale’s work and that was wonderful. I loved seeing the different ways she showcased hand knits. And part of the class was “hands on” and we all went outside and took photos of our finished knits. Gale pointed out some great features of my library for use as photo backdrops and I loved seeing it through her eyes. I brought my Hemlock Ring Blanket to photograph. It’s been finished for months and I just hadn’t been able to find a good way to showcase it. Thanks to a bike rack and some decorative grasses (and Gale’s keen eye) I found a great spot right outside the library door. In case you’ve forgotten after all this time, the yarn is Cascade 220. And, while I have loved other versions of this blanket, mine just doesn’t excite me. It’s okay but I don’t love it. In fact, I’m sort of meh about the whole thing. I did enjoy knitting it, though, and perhaps it really just needs a more severe blocking. 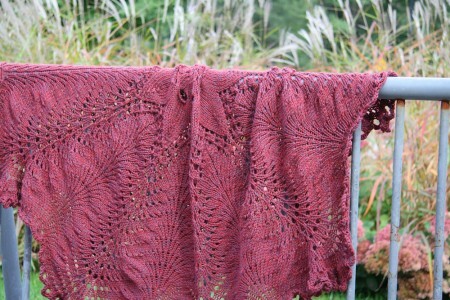 I am pretty happy with the photos of it and I’m thrilled to have discovered a new place to photograph my knits. I just have to make sure no one catches me throwing an afghan over a bike rack or a pair of socks over a bush. It is my place of business, after all. I think a more severe blocking would be just what the doctor ordered. You can see that the stitchery is beautiful. It just needs to be stretched into submission. I’m glad you had a great day for it. Sounded like a wonderful class. Our library has gotten used to seeing me knitting in a corner (go there to escape the visit of the Bug Man). It would only be a little step up to add knit photography, and they have several interesting spots. Thanks for the inspiration! Yeah I have to agree that a more severe blocking would open it up more make it lacier. Lucky you to take a class with Gale! She certainly does get it. Block that blanket! I had a great time too — thank you for pulling it all together. Yes, that baby needs to be blocked. I bet you guys had a great time. I dunno, I think it’s stunning. But then again, I didn’t have to stare at it all the time it was being knit. Maybe familiarity breeds contempt? I love the new setting. So glad it was wonderful! Your blog and beautiful photos inspired me to get a new camera last week!! Nothing too fancy..just a step above the one I had. Time to get out there and practice taking photos. I think it’s a lovely blanket but it does need more blocking to make it pop. Looks gorgeous over that bike rack! I love that first blanket photo where there is a faint echo of the blanket color in the grasses behind it. And yes, I think a more severe blocking would make you a happier camper. Quick, before it gets colder and things take longer to dry, do it! Your blanket is beautiful and I love the color. It looks fabulous with the grass in the background. What a great workshop! 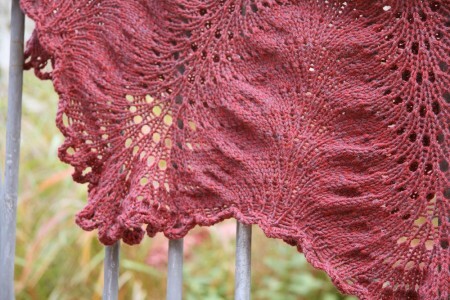 It’s gorgeous, but I agree, a strenuous blocking is in order! 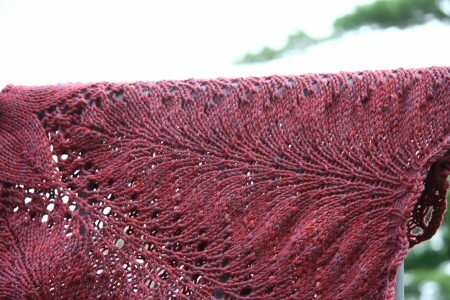 I think it looks lovely as it is but a good blocking would probably improve it. You really should because the color is lovely. (so similar to your blog background). The class sounds great. What they all said… sounds like you had a wonderful day! Gorgeous knitting, as usual, Carole! Lovely hemlock blanket. I bet that it is ever so soft, since made of cascade 220 ! And I agree with others that a really hard blocking would make you much happier with the outcome. It truly is a stunning pattern. I agree that a good hard blocking would work wonders on that blanket. Although, there is no rule saying that we must love everything we knit. And people seeing you with socks in the bushes? You’re working a project and using the lovely landscaping at your office as background. Where’s the shame in being proud of how your part of the world looks? I am jumping on the blocking bandwagon. But I love the color and the photos. What a great idea for a workshop! I’d go to one like that in a heartbeat. It’s really fun to have someone show you how to see things in a different way. I’ll bet the patrons at your library would “get it” – cause they must know you are an avid knitter!!! What a fabulous idea for a library program! I have zero creativity when I’m photographing my knits. Lay it on the deck or lay it on the patio table? Your Hemlock Ring is beautiful! I love the color too. The workshop was wonderful yesterday and I learned alot! Your hemlock blanket is beautful and looks great photographed. I also can’t believe I didn’t realize you were THE Carole Of sock madness. I’ve participated in it every year since it started and plan to continue. I look forward to it every year! It was nice getting to meet Julie too! Thanks for organizing such a nice workshop. Gale is great! Do you really think that people will view you differently if they see you arranging handknits on the bike rack? Don’t you have one of Franklin’s Hide No More t-shirts? I vote for a hard block and maybe a bit of steam around the edges. I really like how the color compliments the stitch pattern. Beautiful work, as always. I hadn’t seen this pattern before and it’s thought-provoking. Seriously, a good class happens because of a fabulous group of students. Thanks for opening your library to us! ps I understand what you are saying about not doing your knitwear photos all over your work, it’s hard to mix the two so vigorously. I think you need to sneak over there on Sundays & holidays. You are one industrious lady! Cool class idea. The photo really highlights the pattern… and I agree that re-blocking might help you see this in a whole new light. 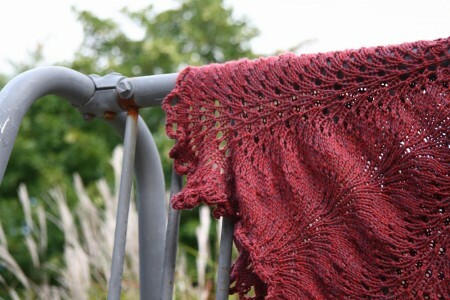 Maybe you just love the feel of laceweight over your shoulders these days. I’m so sad I couldn’t make it :o( Love the blanket, though!